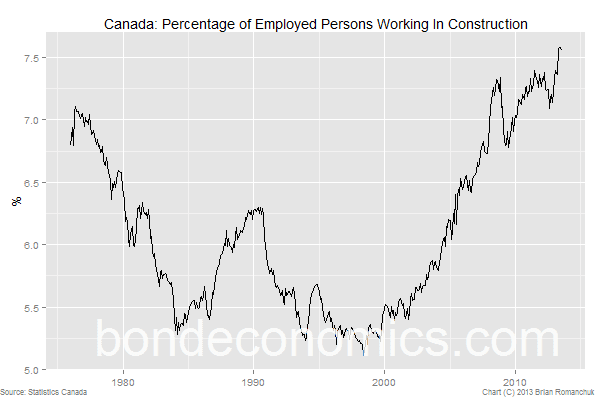 The above chart summarises the underlying problem facing policymakers in Canada: construction jobs have become too large a portion of the economy. There has been a lot of discussion of the Canadian housing bubble. However, house prices are not really the problem; the vulnerability of the economy is via the labour market. Too many housing units are being constructed, and construction workers will be shed as this winds down. 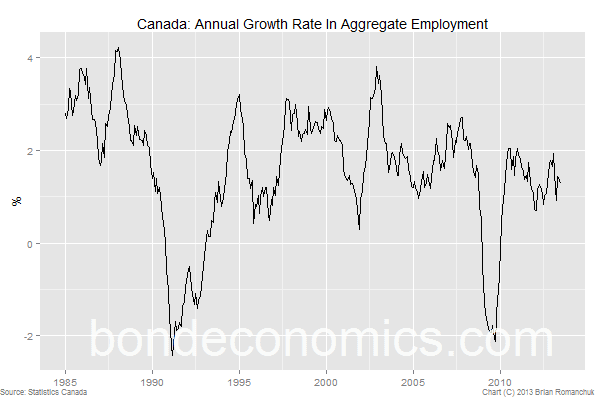 The job market in Canada, as is the case in the United States, has become structurally sclerotic. The annual growth rate of the total number of jobs (in all sectors) has not been able to break above 2%, despite the seriousness of the downturn in 2009. As such, it is unclear whether the job market can absorb a serious outflow out of the construction trades (as well as other sectors that have ridden the housing bubble, like Retail). 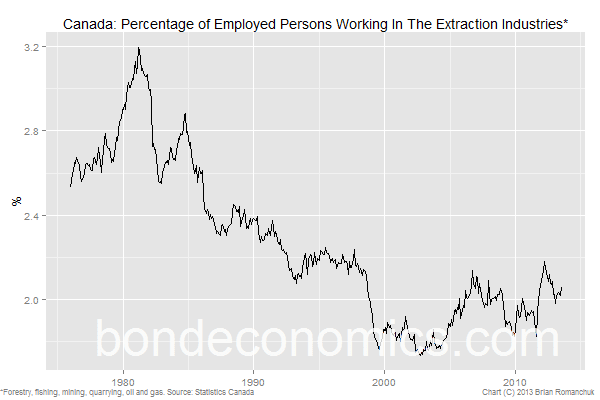 Although the Canadian economy is stereotypically related to the extraction industries (fishing, forestry, mining, oil and gas), the employment in these sectors is very small relative to Construction or Retail. Commodities are very important for the Canadian dollar and stock market, but they have too small a footprint on the domestic labour market to overcome the potential job losses as the construction market cools. Domestic interest rates will be following these labour market trends. Oh yes, Canada is doomed for sure. The entire Canada employment market in general is declining in numbers of high quality, full time, well paid jobs. The increase in declining employment, more unemployment, more under employment of people not working, or barely working below their skills is a bad sign. The increasingly useless and expensive post secondary education, rising school, consumer, and housing debts will someday explode. All these are going to collapse Canadian society. From now on, every generation will decline more than the previous one until the fall. Canadians can't make enough money or work enough while the country mindlessly imports fantasy numbers of immigrants who will only end up joining the Canadians and immigrants before them, in a national depression, recession, deflation. Some city metro regions are worse than others in a bad lot. An example is Victoria BC Canada. It is over rated, over populated compared to the limited economic prospects. It is not living up to potential as it is always backsliding. Read the comments of people on www.ratemyemployer.ca, www.topix.com, www.yelp.com, www.thedirty.com, Yahoo Answers, BBB, and others. Do your research or get screwed over by the cheerful propaganda. The governments, corporations, agencies are only interested in importing cheap foreign slave labour, and not care about the actual sustainability of Canadian society. It will over dose on population immigration as people living long term in Canada don't see any light or hope in having more children who will be worse off than parents and grandparents. Concentrating on our country economy is one of the primary thing we have to consider. You shared an really useful info over here. thanks for this post.